More than 300 students gathered on The Bricks early in the morning on Thursday, August 15, to participate in the University of Miami School of Law's 15th annual HOPE Day of Service. 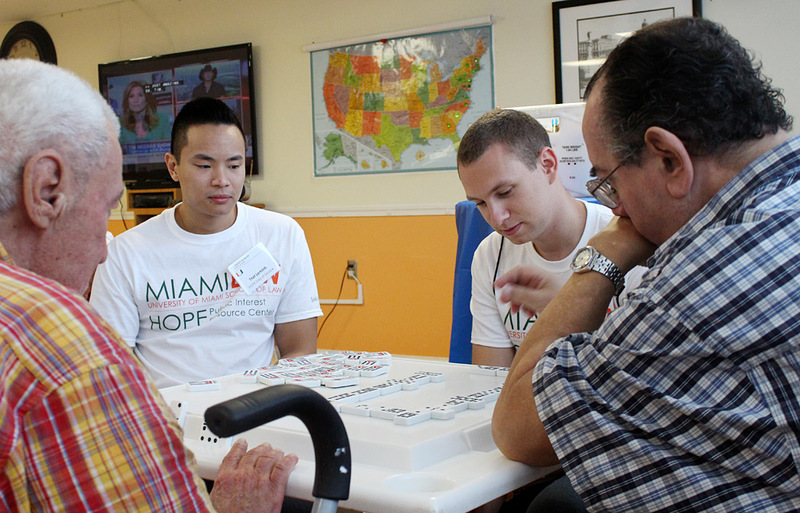 HOPE, Miami Law's Public Interest Resource Center, provides opportunities for law students to participate in pro bono and community service events. New and returning Miami Law students made their way to 14 different sites across Miami-Dade county, including Virginia Key, Coconut Grove, Homestead, South Beach, and Coral Gables. Each volunteer site was staffed with a team of site leaders - upper-division students ready and willing to share advocacy opportunities with the volunteers and inspire them to take advantage of all of the wonderful hands-on public interest opportunities while at Miami Law. Student volunteers served at local homeless shelters, environmental clean ups, animal rescue missions, children's hospitals, preschools, and summer camps. Every year, HOPE Day of Service kicks off new student orientation, with over 75% of incoming law students showing their character by choosing to give back even before they even start law school. "Hope Day of Service was a great opportunity for me to give back to the Miami-Dade community, while meeting my future classmates and upperclassmen. I recommend every incoming law student participate in HOPE Day of Service, and hope to be a site leader next year," incoming 1L and Miami Scholar, Stephanie Rosendorf stated. "I came to Miami Law because of the strong commitment to public interest advocacy." Students signing up for HOPE Day listed their preferred service site and the HOPE Day committee matched them to one of the 14 sites city-wide. In addition to benefiting the Miami-Dade community, students can log their community service hour on the HOPE website, which is a great way to jump start a student's HOPE Community Challenge. Students who complete 25 hours of community service each year are recognized annually at the Spring Reception. In addition, students are encouraged to sign on to the HOPE Pro Bono Challenge, which recognizes legal advocacy and engagement on a pro bono basis. Students who complete the Pro Bono Challenge, 75 hours of pro bono service before graduation, are recognized at graduation and a receive transcript notation. Lauren Lee Pettiette, a rising 3L and Miami Scholar, served as this year's HOPE Day Chair. "HOPE Day of Service was a great success this year. I have heard exciting stories about planting in the gardens, coloring and playing games with kids, and cleaning up the beaches. HOPE Day of Service reminds us of the necessity of being a servant leader as we prepare ourselves to be attorneys. Community service and the pro bono ethic should be an integral piece of a law student's, and attorney's, life," Pettiette said.